This fall Hamilton, the musical and cultural phenomenon, drew standing-room-only crowds from adults and children of all ages during its run at the Boston Opera House. Along with the show came the Hamilton Education Program — a partnership between The Gilder Lehrman Institute, the producers of Hamilton, and the Lin-Manuel Miranda family — in which students from high schools with high percentages of low-income families are invited to see the show and integrate Alexander Hamilton and the founding era into their classroom studies. 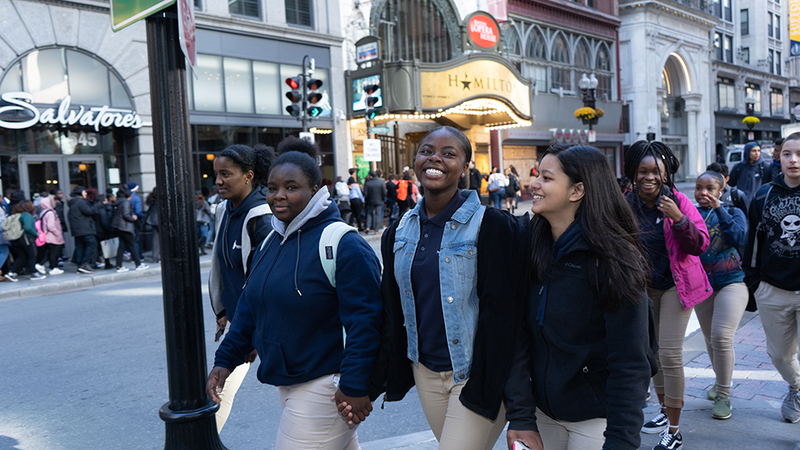 2,500 students from schools across Massachusetts attended two stirring special events in Boston, where young people performed their own Hamilton-inspired dance, music, and spoken word on the very stage where the play had been performed. These impassioned readings and performances were accompanied by thundering applause and cheers from an audience that owned each line being recited. By presenting an original work on the founding era, each young person had earned their way to this stage, using their creativity to bring history to life through monologues, rhymes, songs, and poems. Before the show, teachers guided students through a unique, hands-on class project using Gilder Lehrman Institute resources to introduce the people, events, and documents of the founding era. Students also learned how Miranda, the creator of Hamilton, incorporated primary sources into the songs he wrote for the show and used that knowledge to produce their own performance pieces.